The waterfront enclave on the eastern edge of New York’s Long Island draws heavy hitters from Hollywood, Wall Street and Washington, and the appeal has led to asking prices for homes in the area to sometimes hit nine figures. The elite attraction has also made the 21 villages and hamlets that make up the Hamptons a pop culture mainstay, with the region appearing as the setting for things like Ina Garten’s “Barefoot Contessa” cooking show to rampant bickering on “The Real Housewives of New York City.” While the perpetual media presence makes the area popular with visitors during summer months, real estate in the Hamptons has taken a hit and is now being outperformed by the Massachusetts island of Nantucket. Its culture may be grounded, but Nantucket’s home prices are going sky-high. Overall home sales on the 48-square-mile island were over $1B in 2017, up 7.7% from 2016. Residential real estate sales were down 6.6% in the Hamptons in Q1 compared to Nantucket’s 14% increase in the same time frame. The median listed home price on Nantucket is $2.4M compared to $2.1M in the Hamptons, according to Nantucket Realty Advisors. The Massachusetts island’s performance is not surprising to one longtime Hamptons developer. Ullian has been developing properties in the Hamptons for 40 years, including the recent Ponquogue Point condo development in Hampton Bays. While he still has confidence in the pricey stretch of Long Island, he also sees how its change over the years has elevated places like Nantucket and Martha’s Vineyard, an island less than 20 miles to the west of Nantucket that has attracted a bevy of former first families, like the Obamas and Clintons, during the summer. “What you find in the Hamptons is a lot of ZIP code snobbery, which transmits your social status. There was a time when people in the Hamptons did not want to overtly display their success or wealth, and that’s changed a lot,” Ullian said. “The Hamptons are very much a state of mind and business opportunity, which adds a twist to it." Those interviewed for this story unanimously highlighted the difference in commercial development between the two ritzy retreats. It is easy for a New Yorker to feel connected to Manhattan in the Hamptons, as the area features chain retail offerings like Barry’s Bootcamp, Starbucks and Ralph Lauren. But the American designer was the inspiration for Nantucket to crack down on chain retail. Ralph Lauren opened a store on Nantucket in 2005, and some residents were displeased by the idea of more national retailers following suit. While the Ralph Lauren remains open, Nantucket residents voted in 2006 to ban other chain stores from opening in downtown. While the measure has kept chains out, a growing airport is bringing in a new stream of people. Many visitors to Nantucket arrive by ferry, but the island is also benefiting from increased commercial air service to places like New York City, Charlotte and Washington. 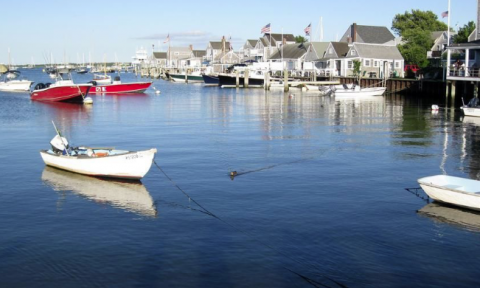 Nantucket’s so-called authenticity and close-knit community can appeal to buyers. The question lingers of if the easier access will cause a commercialized transition in Nantucket like what Ullian saw over the years in the Hamptons. One island expert isn’t worried. Weissman, who launched the Nantucket Realty Advisors division of his company this year, said that while real estate interest is high on the island, there are measures in place to maintain its identity and prevent overdevelopment. The Nantucket Land Bank is a public agency created in 1983 that levies a 2% real estate transfer fee on most property transactions on the island. The group uses the accrued resources to buy and operate open spaces and what it calls “endangered landscapes.” The measure has resulted in nearly half of Nantucket being protected open space and unavailable for development. The developer is spearheading a campaign to raise $120M to build a new Nantucket Cottage Hospital, and, while critics initially said the goal was too high for such a small hospital, Percelay said they have already raised $116M thanks to what he said is a donating class unique to Nantucket. The island isn’t without its faults. Percelay admits the soaring real estate values have led to a shortage of affordable housing options for the workforce that keeps Nantucket’s restaurants and retail running, but he also feels confident the island will be able to hold onto its grounded roots and eventually find a solution.